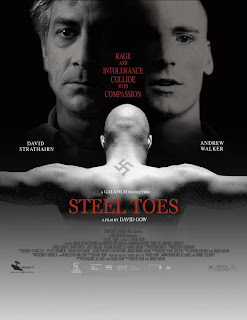 Cam's Cinematic Episodes: Film Review - STEEL TOES: David Strathairn Rules This Stage! Film Review - STEEL TOES: David Strathairn Rules This Stage! Films based on stage-plays have an uncomfortable tendency to rely too heavily on coincidence, stagy set-ups, and histrionic acting. A great translation, such as James Foley’s 1992 scorcher Glengarry Glen Ross, draws the viewer closer into its world, providing a deeper comprehension of motivation and character. A bad interpretation, on the other hand, is invaluable in providing the viewer with a better understanding of the shifts in story-telling that are required in a proper adaptation. The dramatically powerful new film Steel Toes, directed by Montreal-based film-makers Mark Adam and David Gow, and based on Gow’s hit play Cherry Docs, is only moderately successful, but still relatively absorbing. David Strathairn, the intense hawk-like presence from The Bourne Ultimatum and George Clooney’s Oscar-nominated Good Night, And Good Luck, stars as Jewish lawyer Danny Dunkleman, a fiercely logical and business-minded professional. He is assigned to plead the case of deceptively slow-witted Neo-Nazi skin-head Mike Downey (Andrew Walker), who has viciously attacked and brutally beaten an East Indian immigrant (Ivan Smith). Initially hammering down his client’s bluster with condescension and heavily stated superiority, Dunkleman must go to work in preparing his insensitive client for court. However, he must also face the unexpected changes within himself that result from peeling away the layers of deception that Downey hides behind. On a purely narrative level, one could easily accuse writer David Gow of simply altering a winning formula to suit his own needs. We’ve all seen similar tales of violent criminals being redeemed by tough mentors before, but Gow seems hardly interested in delivering a sturdy genre entertainment. Rather, he uses his framing device to delve deeply into the souls of his characters, and to engage in endless streams of expressive and insightful dialogue. He’s in terested in the true nature of hatred and intolerance, how it changes people, and whether redemption is possible. In Strathairn he couldn’t have found a better lead. Steely-eyed one second, and on the verge of collapse the next, Strathairn is fearless is creating a compelling portrait of an often distant man whose faith in his own logical and liberal humanist nature is called into question. In one powerful scene, following a particularly expressive meeting with Downey, Dunkleman has a near breakdown over the enthusiastic services of a homeless Squeegee kid. It’s a shattering moment, with a beautifully subtle shift from annoyance into fury, ending in uncontrollable weeping. It’s the type of moment that would be endlessly reused on awards circuit performance reels, and the actor makes us feel every moment of it. Similarly effective is an uncomfortable dinner table scene with his wife (Marina Orsini) and two guests, which uncomfortably swings between irate outbursts and silent, simmering rage. Andrew Walker isn’t quite in the same league as his seasoned co-star, but he has enough solid material to make his presence known. The actor is quite skilled in raising the annoyance of the viewer. His Mike Downey is a simmering bully with low self-esteem who hides behind a cocky smile and unjustified sense of entitlement. He pushes Dunkleman towards aba ndoning logic and words and embracing catharsis through violence, and shows an intriguing mastery of manipulation and psychological control. Yet the character’s most telling scene comes when he is in solitary confinement, destroying his cell like a dervish from hell before breaking down into melancholy whimpering. He’s a caged animal, who has lost his humanity to hatred. While these performances are viciously engaging, there are a number of elements of Steel Toes that prevent the film from being as flawless as its actors. The most harmful element is the resolution of the film, which features Downey’s unconvincing psychological breakdown, followed by abrupt emotional changes in both characters. Strathairn and Walker are committed, and are aiming for the fences, but these developments feel too “writerly” and out of character. The scen es may have worked in a play-like setting, where sudden changes are more acceptable, but in film it rings false. As well, Dunkleman's relationship with his wife is very shoddily handled, and the passage of the time that the story encompasses is not well established. The look of the film, and cinematography by Mark Adam, is often darkly beautiful. 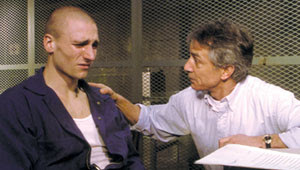 In particular, the prison meeting scenes are filmed in rich brown hues which provide a sense of misplaced comfort amidst the emotional chaos. Not quite as effective, unfortunately, is the decision to stage Downey’s savage assault in a scene edited like a late eighties music video. This particular stylistic decision badly reduces the horror of the moment. In terms of its content, Steel Toes isn’t quite as incisive as simil arly themed films such as American History X or The Believer. It’s a small film, but one that is definitely worth checking out simply for the joys that come from watching two masterful actors firing on all cylinders. 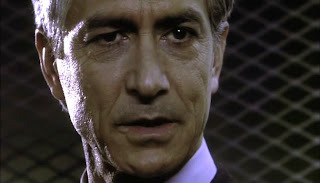 It’s also a further testament to Strathairn’s position as one of the best character actors working today.